RT is in the running for 10 prizes at the Shortys, the world’s leading social media awards. Here’s a look at some of the projects which stood out in the past year, and if you were impressed, then get voting and help RT make a clean sweep of the awards it’s up for. Now in their ninth year, the Shortys were the first major social media prizes, and awards are voted on by a jury that includes media-savvy celebrities like Stephen Fry and Jamie Oliver, and industry professionals such as Huffington Post founder Arianna Huffington, and Alex Ohanian, the co-founder of Reddit. As well as organizations, individual nominees include Oprah Winfrey, Britney Spears and Samuel L. Jackson, and the winners will be feted at a star-studded gala in New York in April. The Shortys are also allowing social media users to vote for Audience Honor awards in each category. You can do so by following the links above, and registering your preference with the click of a button. In a year when the overall view count of all our channels crossed the 4 billion mark, RT is in the running for Best Overall YouTube Presence, while our Facebook and Twitter teams are up for the Best in News & Media awards, where they face media stalwarts such as the New Yorker. #1917LIVE is “arguably the most ambitious, large-scale LIVE history re-enactment to ever be attempted on Twitter” in which the story of 1917, perhaps the most important year in Russia’s history, was “tweeted live” from over 50 interlinked accounts of Nicholas II, Vladimir Lenin and Kaiser Wilhelm with tweets accompanied by archive photos and video, as well as specially-produced content, to bring the story alive, as the year reached its dramatic climax with the October Revolution and Russia’s exit from World War I. 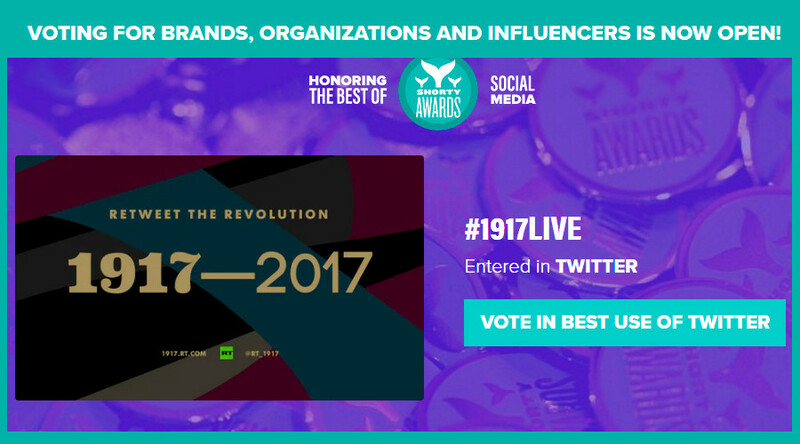 The project is up for Best Use of Twitter, while #1917LIVE, which helped bring together the vast array of info posted by RT, is in position to claim Best Hashtag. From virtual commemorations to real-world ones: For the 71st celebration of Victory Day, RT produced the most integrated coverage of the days leading up to the parade in Red Square, and the procession itself. Viewers were given unprecedented access with Periscope and Facebook broadcasts from around the world, and spectacular immersion with 360 panoramic video cameras mounted on jets flying above Red Square, and the tanks passing below. #DigitalVDay, which reached over 3 million views on YouTube alone, has been entered for Best Live News Coverage and Best in Live Events. In The NOW offers a fresh, sometimes irreverent, and often insightful take on the news zeitgeist “by following two simple rules: Don't ask boring questions and don't tell boring stories.” In The NOW has gone from zero to over half a billion views in just 18 months, largely through shares on Facebook, which has become the dominant news platform. In The NOW is in the running for Best Facebook Presence while its 2016 election spoof Buy Political Bullsh*t Infomercial, is in the race for Best Facebook Video. Space 360 is the first panoramic video documentary show made in space, and offers an unprecedented look at what life at the International Space Station is like, with cosmonaut Andrei Borisenko serving as the guide. The show, which will continue to be broadcast through 2017, is in the Best Use of 360 Video category. RT is also up for Best Use of Gifs – which our teams use to give a different angle to even the most serious and complex stories – while RT’s 360 news app, which offers viewers exclusive access to our panoramic video content, is a contender for Best in Photo & Video Apps. Voting will close on February 16, and fans of our programs can vote once every day until then, and automatically share their preference on Twitter and Facebook. If RT is recognized in any of the categories, it will continue the channel’s streak of success in recent industry awards. Last year, it beat the BBC and the New York Times, among others, to win the audience-voted Social Media News & Information prize at the Webbys, the most high-profile of internet awards. 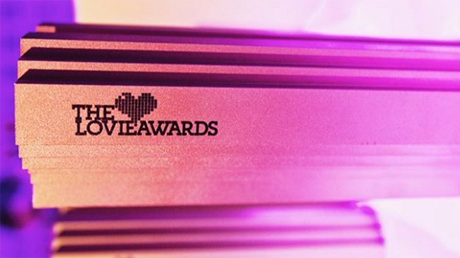 It also captured seven Lovies, which are the main European awards for content makers based on the continent.